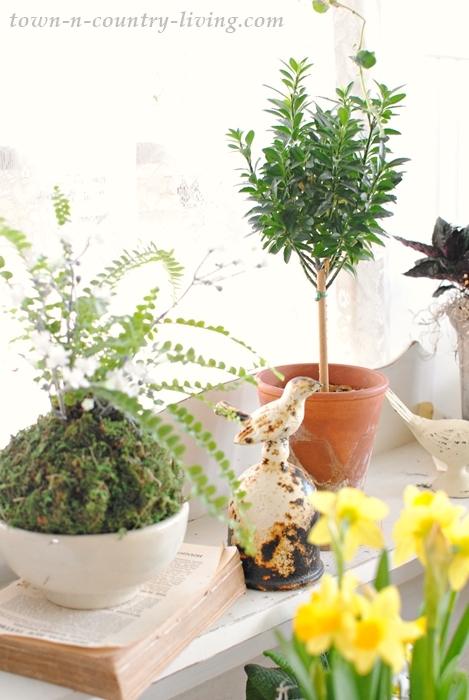 Most of us know that plants purify the air and so we bring them into our home. They lend beauty, texture, and health benefits. Unfortunately, they often come in plain plastic pots. 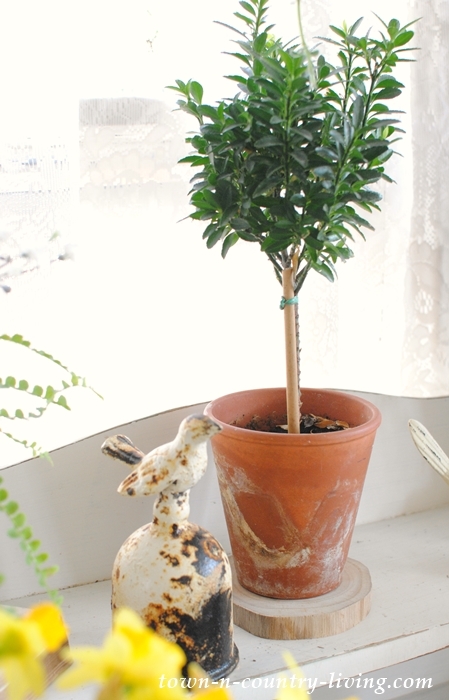 Today I’m sharing a few creative ways for upgrading houseplants to give them a customized look. 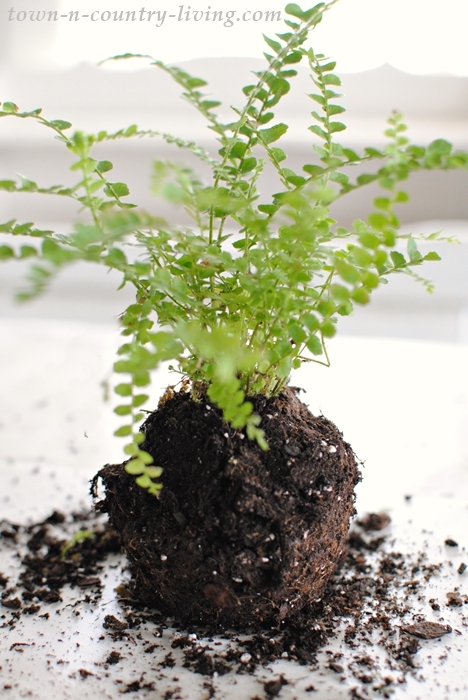 This is a cute little Lemon Button Fern, which is easy to grow. 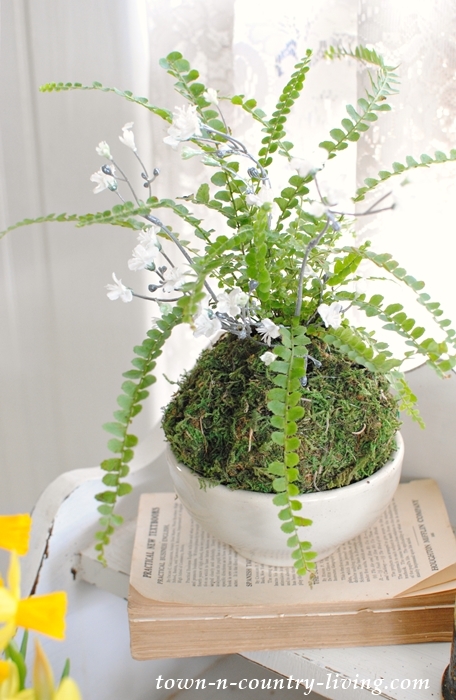 Its dainty fronds enjoy indirect light and prefers the soil moist, but not saturated. This is what it looked like when I brought it home. I decided to wrap it in sheet moss which is underneath the plant. I cut the moss into a circle, just large enough to wrap it around the dirt. After taking the houseplant out of its container, I used my hands to mold the dirt into a ball shape. If you want to add more dirt, add water to potting soil (water makes the dirt stick together) and pack it around the existing dirt as though you’re shaping a snowball. 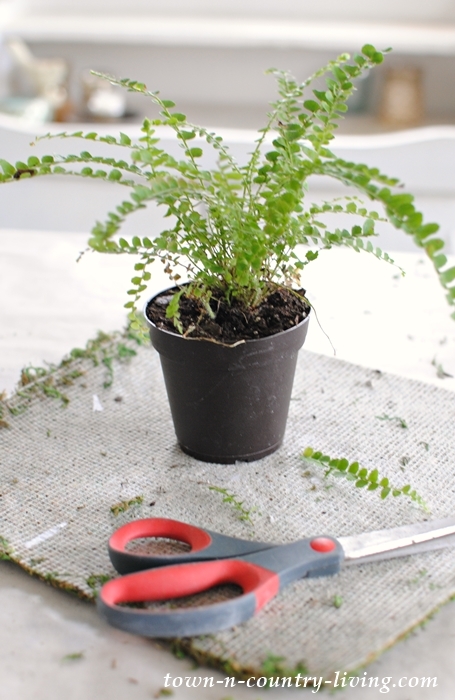 Soak the moss sheet in water to make it more pliable. 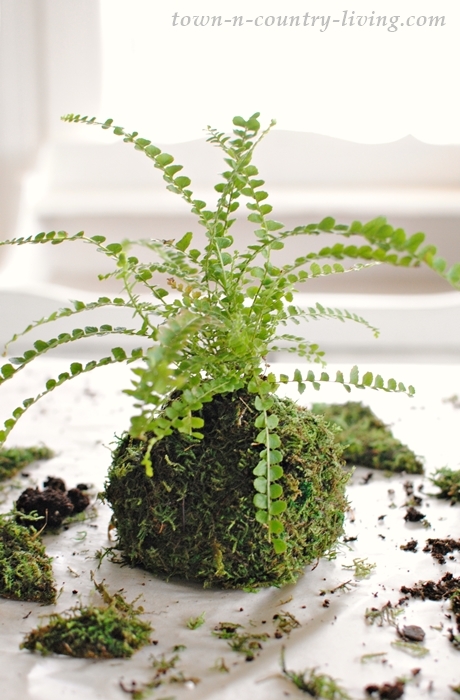 Set the plant in the middle of the wrong side of the moss and wrap the moss around the dirt ball. Using a large string of fishing line, criss-cross it around the ball and tie the two ends together to keep the moss in place. I stuck a few stems of dainty white silk flowers into the ball to give it a springtime look. Then I placed the ball into a vintage white ironstone ball. My new Alsobia, also known as Lace Flower, gets the same moss sheet treatment. This time, however, I didn’t shape the dirt into a ball. Since the plant is already rounded, I kept the dirt the same shape as the pot it came in. Remember to secure the moss in place by wrapping fishing line around the outside. I decided to hang this plant in front of the window since it enjoys bright light. You only need to water Alsobia when the soil dries. I used jute twine to create the hanger. I knotted two long strings around each other for stability, and then tied the four ends around a hook in my ceiling beam. 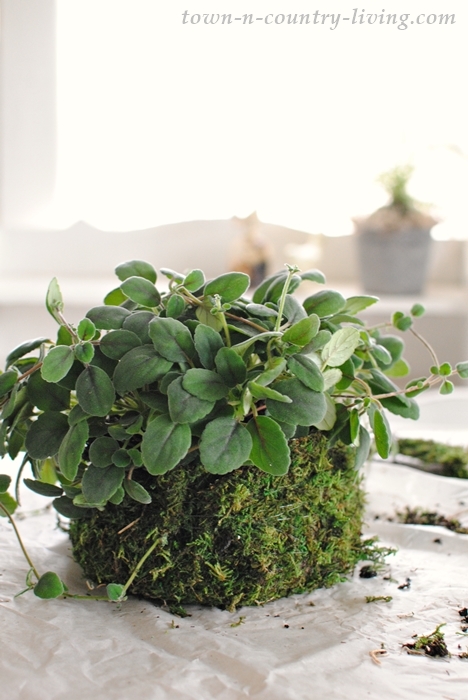 To water the plants in the moss ball planters, you can either let the ball sit in a bucket or sink with water, or carefully water the soil by gently pulling back the top part of the moss sheet. Isn’t this cuter than hanging the plant in its plain plastic pot from the store? 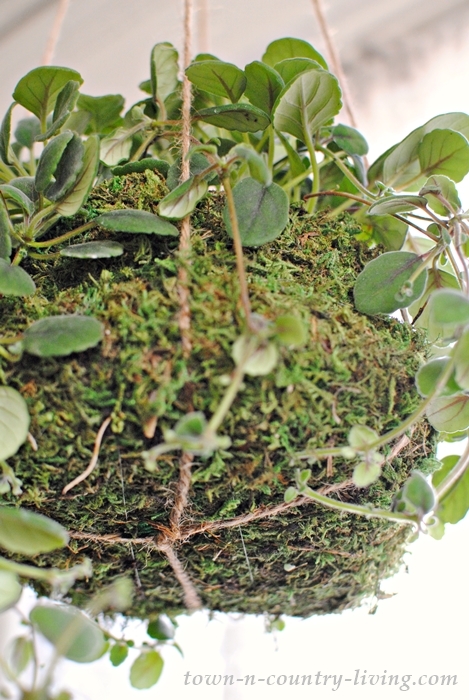 Upgrading houseplants with sheet moss “baskets” is easier to do than you might think. It’s definitely worth a try. 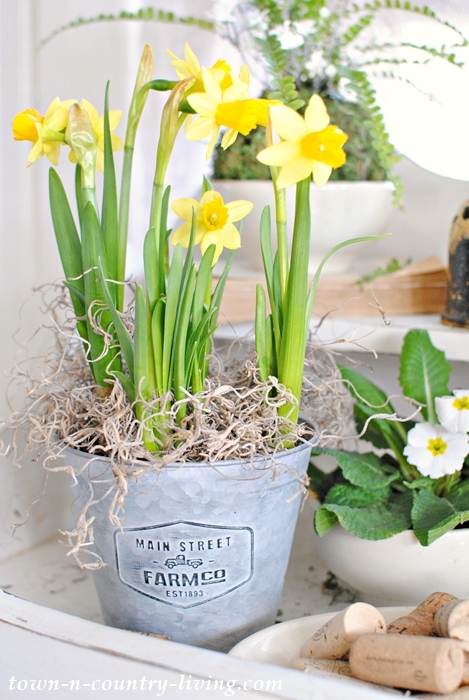 Right now you’ll find an abundance of spring bulb plants at the store. They’re typically wrapped in shiny foil. Put them in a new container like galvanized metal or a terra cotta pot. You can keep them in their plastic pot – just remove the foil and insert into the new container. Dress them up by adding a bit of Spanish moss to hide the dirt. So easy, and the little daffodils look happier now. My new Purple Waffle plant gets the same treatment, but this time I removed its plastic pot and inserted the root ball and dirt into a cement-type container. Upgrading houseplants is so easy and they look like they were purchased at a fine floral store instead of the local grocery store. The Purple Waffle likes medium light and should be watered when the soil is dry to the touch. 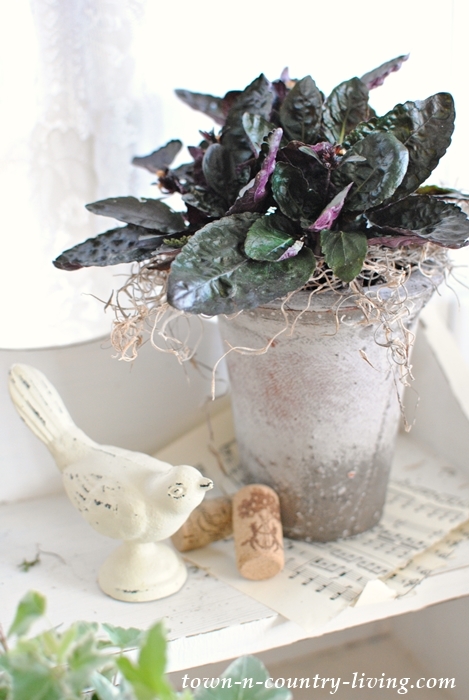 The little ivy is set into a white-washed terra cotta plant. 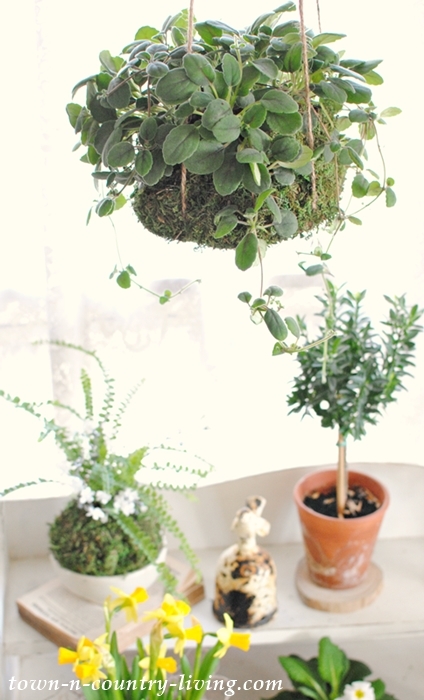 Another easy way for upgrading houseplants. 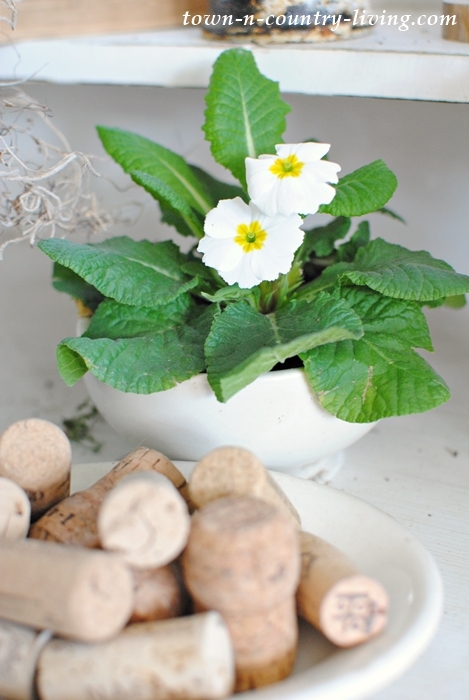 My little white primrose finds a new home in a vintage ironstone bowl. 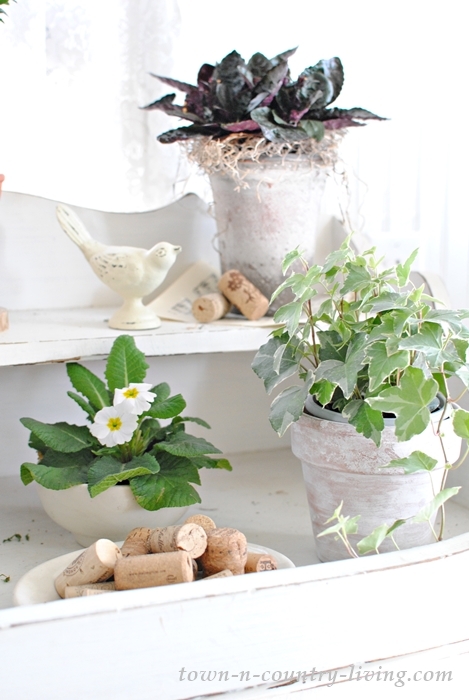 Look around your home and you’re sure to find creative planters for houseplants. I love topiaries and I’m so proud of myself for keeping my Boxwood topiary alive and healthy. He’s going to need a trim pretty soon before he gets too bushy. 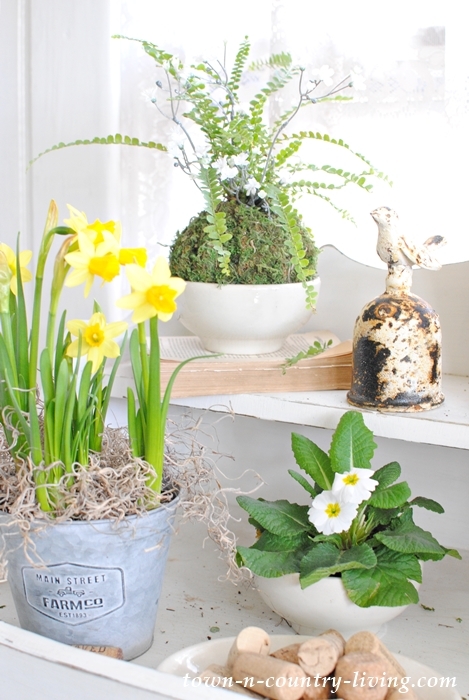 I hope you’ll try some of these ideas for upgrading houseplants. Especially the moss containers. They were so easy and I think they make the plants look so much better! 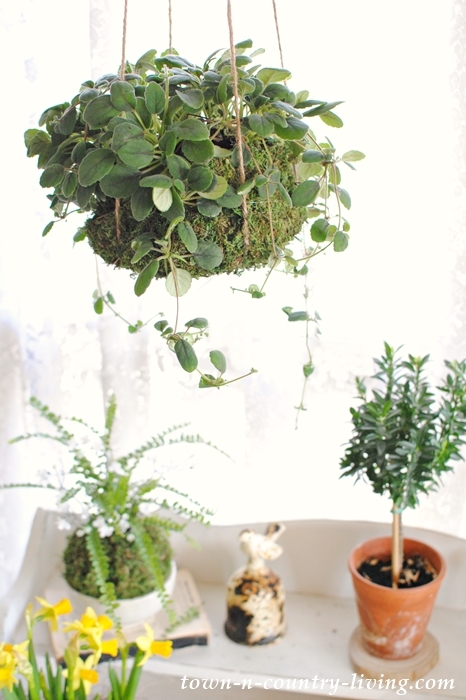 What are some of your favorite houseplants that you find easy to grow? I have a load of houseplants, but yours look much prettier than mine. Love this post and can’t wait to “pretty” mine up. Thanks for the great ideas. Good morning! I love how you have upgraded your plants. I do this too, never leave them in their oricinal containers. I also use different types of moss around them to hide the dirt. Happy Valentine’s day! 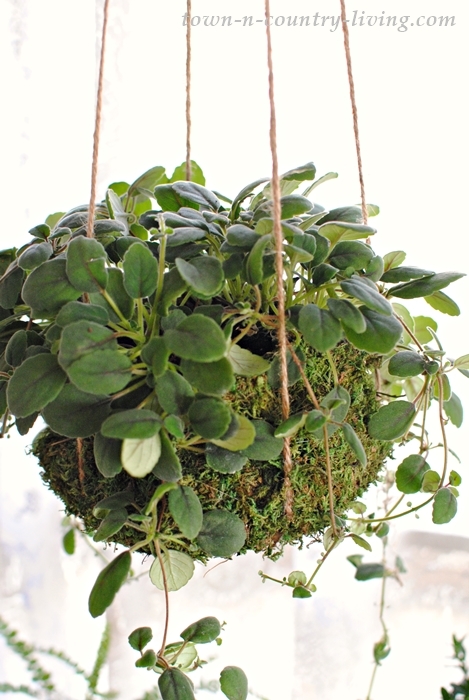 Love the kokedama! 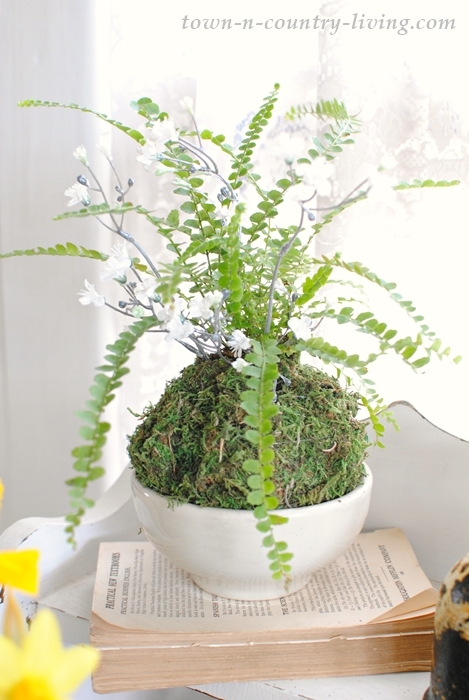 I had one in my home last year with a little fern and it lasted all summer! Just had to remember to soak it! Love the look and think I’ll be doing more this year! These are really beautiful ideas! I am excited to have some new varieties of plants to try, and for pretty ways to “pot” them! Fantastic ideas for transforming their look! Thanks! What lovely ideas you have shared. It is inspiring me to buy some different house plants and new pots. I hated using plastic water catching dishes under my houseplants. I go to Goodwill and I find all kinds of bowls, dishes and serving ware that dress up my planters and protect my furniture. Great place for finding planters at a great price and helping the community effort too. Love these ideas! Thank you! !